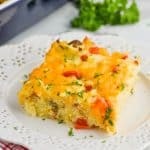 This easy Hash Brown Egg Casserole recipe is full of amazing flavors. It's such perfect breakfast comfort food that you will want to make for your family again and again. In a medium skillet over medium heat, cook the breakfast sausage until cooked through. Drain and set aside. Cook the diced bacon in the same skillet, until crisp. Drain and set aside. In a large mixing bowl, whisk the eggs. Mix in the eggs, red pepper, onion, milk, one cup of the cheddar cheese, sausage, bacon, and spices. Mix in the hash browns. Pour the entire mixture into the casserole dish. Top with the remaining cheese. Cover with aluminum foil and bake for 50 minutes. Uncover and bake for 5 more minutes. Let the casserole sit for 10 minutes and enjoy! This recipe works best if you squeeze the excess liquid out of the thawed hash browns before making this.